It is also a restaurant and has opened its doors for lunch now from 11:00 a.m. to 2:30 p.m. Monday-Friday. Hours will expand in months to come offering breakfast and dinner. In time entertainments will be added. But for now, you can enjoy the vintage circus photographs and posters and Bob Horne, the owner and cook, who is a walking history book with expert detailed knowledge of Sarasota and it's circus past. For anybody who might already know Bob from his popular diner "Bob's Place" that was located in Sarasota's Rosemary District for years serving his unique delicious recipes such as "Skunk Soup" (no, it wasn't actually skunk) or his fabulous meatloaf, neither he nor his great food need any introduction. If you don't know Bob, it's not hard to get to know him or understand why he has such a dedicated customer base and long list of friends. In Bob's Place, Bob often had a joke, often as his own expense, a pat on the back or handshake. He was quick to offer the background story on the framed circus photographs and posters that covered the diner walls or other circus memorabilia. 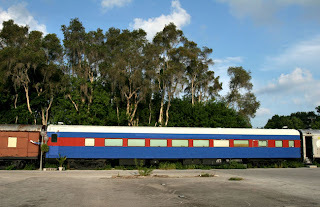 Frequent visitors might also have learned about his biggest circus collectors item, JOMAR (JOhn and MAble Ringling), the famed private train car of circus magnate John Ringling. JOMAR is being slowly restored but until then, Bob's Train is open. 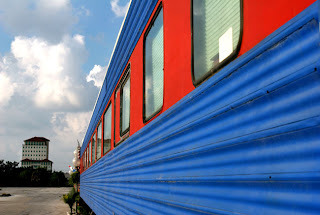 It will ultimately be rolling down the track carrying passengers in the dining cars offering live entertainment from circus acts to jazz and chamber music. Some planned routes are from it's home base in Sarasota, Florida to Tampa for Buccaneer football games and to see the Gators in Gainesville. 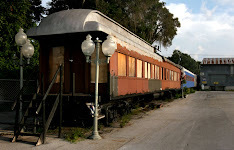 Circus legend John Ringling's private train car, Jomar, is under renovation. 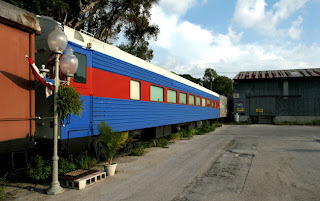 Bob's Train is located at 2211 Fruitville Road in Sarasota, Florida, but because the train cars are real and are on actual train tracks, it's a bit tricky to find. From Interstate-75 take the Fruitville exit and go west toward downtown Sarasota; at N. School Avenue, make a right; you'll pass the Budget Self-Storage (on left) and just as the street starts curving and N. School becomes 3rd St., turn right through the Vengroff, Williams & Associates parking lot and go past the little pink guard shack. Head to the back toward the old brown train car (that's Jomar) in the back, you'll see a big tin warehouse-like building (Sarsota Strength Center and Boxing Club), and enter the main car which is painted red, white and blue.